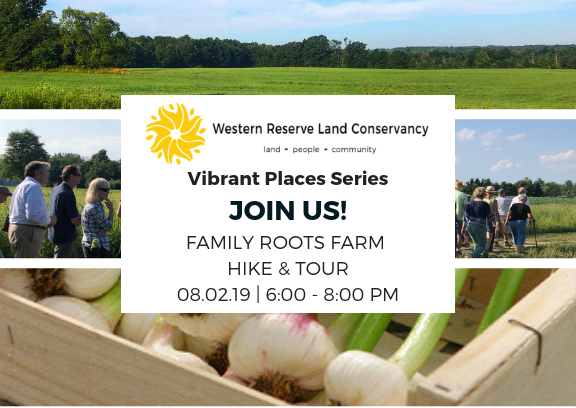 Back by popular demand, join us for a tasty exploration of Family Roots Farm! Located in Hinckley, Rod and Jennifer Sharpnack purchased their 24-acre farm in 2015 from their late Grandfather, Duane Root, to keep it in the family. Today, they grow only heirloom crop varieties that would have been found on our farm when it originated over 135 years ago. In 2016, the Sharpnacks donated a conservation easement on the property to ensure that their land is forever preserved in agriculture. Family Roots Farm is a member of the Ohio Farm Bureau, the Organic Trade Association and is also Certified Naturally Grown. In addition to farming gourmet garlic and heirloom produce, the Sharpnacks produce non-GMO/organic products like jellies, pies, kosher dill pickles, bread and butter pickles, pickled green beans, garlic, scapes, garlic butter, hot cauliflower, and several salsa varieties. In early spring, you can pick up maple syrup; and in the fall, apple sauce and cider from the Sharpnack’s apple and pear orchard. 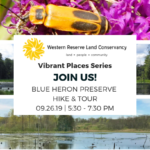 7:00 PM | Enjoy garlic themed appetizers, beer and wine following the hike! Please wear comfortable clothing that you do not mind getting wet or dirty. Close-toed shoes are recommended. Hikers are encouraged to bring: bug spray, sunscreen, reusable water bottles, hats, and sunglasses. Enjoy garlic themed appetizers, beer and wine following the hike! Beer is generously provided by Great Lakes Brewing Company. Registration is limited to 60 people. Please register below to reserve your spot.